Heaven’s Best Carpet Cleaning Rexburg ID offers carpet cleaning, rug cleaning, upholstery cleaning, and more! Our carpet cleaners give you the best value and we are confident that Heaven’s Best is the only carpet cleaning company you need. Call to talk to your local carpet cleaning technician to find out which cleaning service is best for you. Heaven’s Best Carpet Cleaning has been providing the best carpet cleaning for over 30 years in Rexburg. We give you the best value for all of our services. Give us a call today to talk to a live representative who can answer your questions and schedule you for an appointment. Let your local Heaven’s Best Rexburg carpet cleaners renew your carpet and upholstery. After the cleaning appointment, you can rest assured you got the best value with our 30-day guarantee: if any soils, stains, and odors return, so do we at no additional charge. The Rexburg Franchise is a family owned and operated. Adam Howard, the owner of the franchise has been with Heaven’s Best for years. 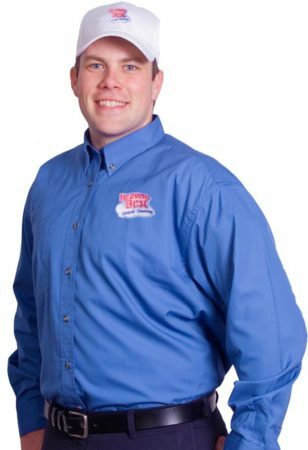 Adam is Cody’s son and loves owning a franchise of the company that his late father built. At Heaven’s Best, we offer services for commercial and residential cleaning, including carpet and upholstery cleaning, tile and grout cleaning and resealing, wood floor cleaning, leather cleaning, VCT (vinyl composite tile) stripping and waxing, minor carpet repair and carpet stretching, carpet dyeing, mattress cleaning, oriental rug cleaning, and wool rug cleaning. We have added window washing, air duct cleaning, and dryer vent cleaning. Our trained technicians are equipped to clean carpet and upholstery in your car, truck, boat, RV or plane. Call us for a free estimate or to hear our current specials. With special rates for commercial carpet cleaning, we can make your carpets, upholstery and all floor types last longer, look better and feel great all year. Here at Heaven’s Best, our technicians are trained and ready to clean your home. We also sell the best carpet cleaning products to use in between cleanings. Clean your couch and love seat for $160, and we will even throw in a free fabric protector. Did a great job! Very personable. Got all the black spots off the carpet including the grease spots on the stairs. It looks great! I would have you back again. Thanks so much. Excellent job, so glad they could come on such short notice. We have beautiful carpet now and our couch looks like new! Great work and excellent price!! Will be calling again. I was very impressed. They were able to take stains out that had been there for years. Having them come and clean helped the moral of the office. Than you for your hard work, attention to details, high quality. We would love to have your again. I really appreciated their promptness. They worked fast and well and did real quality work. Were pleasant and likeable.